Scandinasian: Fashion forward? Or fashion awkward? There is a rumor about Scandinavians. Apparently we are very fashion forward. Maybe I've lived abroad too long and become fashion backward but to me, this garment is just fashion awkward. 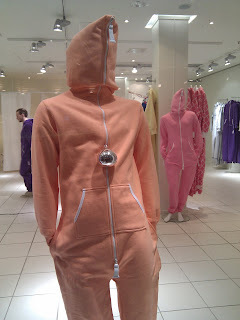 It's best described as a "scary sweat-jumpsuit" or a OnePiece (www.onepiece.com) and it's invented by three Norwegian men. This particular store is located at a prime location in Gothenburg (Arkaden, for those who know) and this is their only product. How did they came up with this design? I guess it could be somewhat practical for men when using the men's room (see the crotch-zipper), but for us ladies it would be a hassle. And another question, have you ever felt the need to zipper your entire face? My husband might want to zipper my face at times, but I would like to see him try! For those of us who haven't understood the obvious, this is apparently design and innovation. It's edgy and provocative! It's a statement piece. And it is all yours for 1350 sek ($200)! Might be one of these in the soft pressies under the tree for you this year...he he. Seriously scary garment.